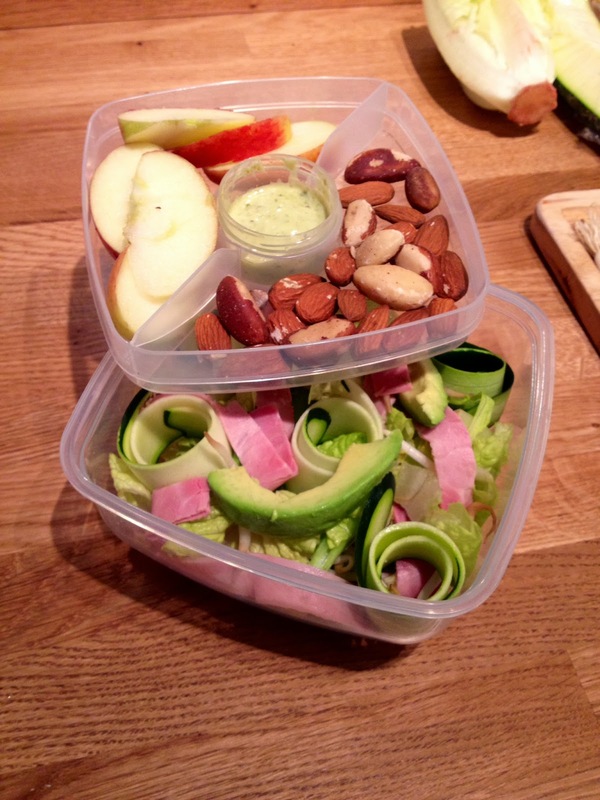 The Saucepot’s Lunchbox is back! Apologies for the silence of late. My kitchen has been undergoing a complete overhaul and it’s been fairly impossible to cook and/or prepare any food, but we are now back in working order and back to business as usual! Quite frankly I’m relieved, I was getting fed up of takeaways for dinner and supermarket pastas and sandwiches for lunch and getting pretty desperate to prepare something fresh for myself. I kicked it off with a salmon and sweet chilli salad on Monday and it was nothing short of heavenly! Mix 3 parts mayo to 1 part pesto to make however much you require, my lunchbox has a little saucepot for dressings and dips, so I just make enough to fill that. It’s probably about a tablespoon’s worth.